You know summer is here when it’s time dust off the grill, dig out your long tongs, and buy some charcoal or refill your propane tank. Enjoy the holiday weekend grilling with friends and family and try one of these easy recipes. Heat a grill to medium high heat. Mix the ground beef, feta, oregano, salt and pepper well and shape into 3-4 patties. Clean and oil the grill and place burgers on grill. Cook for 3 minutes, flip, and cook 3 more minutes or until desired doneness. Mix tzaziki ingredients in a small bowl. Serve burgers with sauce, lettuce, tomato, and red onion. Stir together the tamari, vinegar, garlic, ginger, red pepper flakes, and oil in a medium bowl. Add the cut up chicken and marinate for 15 minutes. While grill is heating, thread the zucchini rounds, chicken, and onion onto the skewers, alternating between ingredients. For the zucchini, thread them the long way through. For the onion pieces, the short way through. 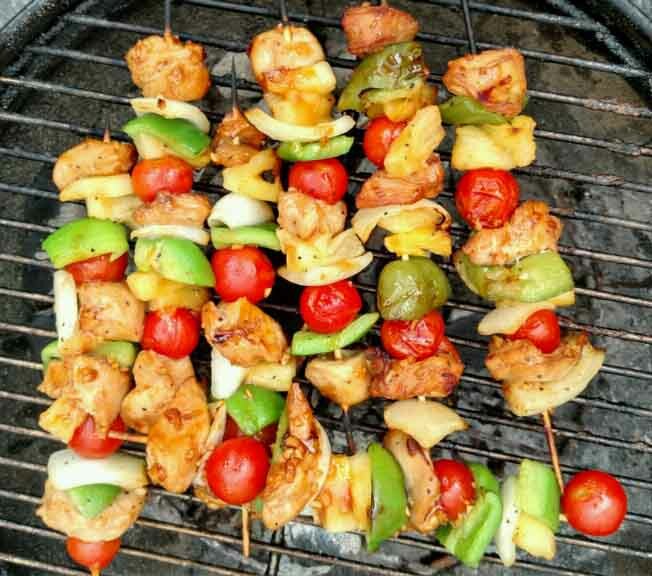 Depending on how many skewers you use, you can double up the chicken pieces. Chicken, onion, and zucchini should be snug on the skewer. Oil the grill with a paper towel soaked in olive oil. Grill skewers on one side until grill marked and cooked, about 6 minutes. Carefully flip using a spatula and grill other side until done, another 4-5 minutes. With a fork, mix together the mayo, hot sauce and bleu cheese, mashing the bleu cheese crumbles into almost a paste. Stir in the minced celery. Set aside. Combine the burger ingredients and form into 3 patties. Grill burgers over medium heat for about 4 to 5 minutes on each side, or until desired doneness. Serve on a whole wheat bun topped with the dressing. In a blender, combine vinegar, lime juice, tamari, tomato sauce, chile, olive oil, honey or maple syrup, cumin, and water. Puree until well combined. Place tempeh pieces in a large baking dish in one snug layer. Pour marinade on top and turn to coat pieces. Cover and refrigerate, turning halfway through, for 2 hours or overnight. Prepare a grill for medium heat cooking. Grill the tempeh, flipping once, until browned, 3-4 minutes per side. Construct sandwiches by adding several tempeh fingers to each bun and topping with coleslaw.